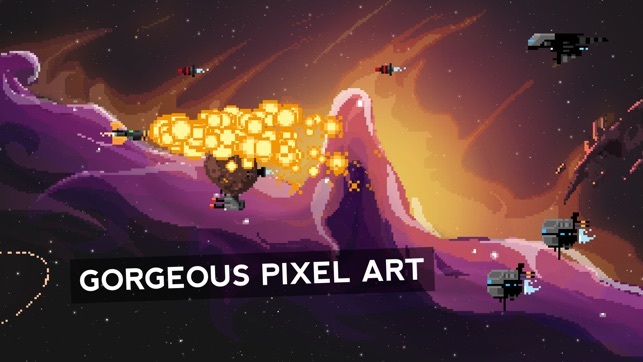 Steredenn: Binary Stars is an award-winning mashup of a classic shmup and a rogue-like, carved in big beautiful pixels, with insane boss battles. 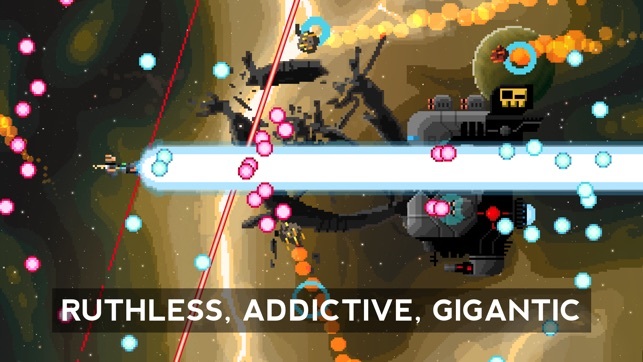 Fly solo, fighting off the worst scourges of space in a never-ending struggle for survival. 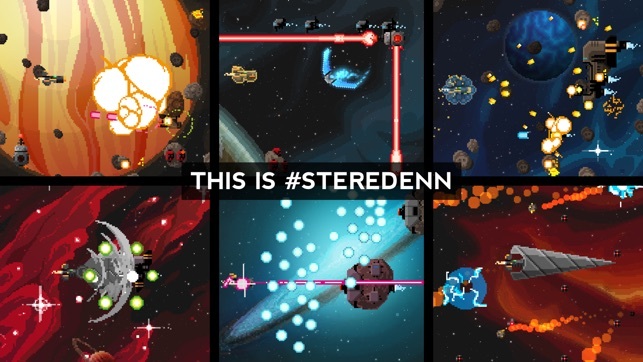 Steredenn: Binary Stars is the critically acclaimed roguelike-shmup for PC/Mac, Xbox One, PS4 and Nintendo Switch, awarded "Best Shoot'em Up 2015" by jeuxvideo.com. With a user rating around 90% on Steam and an average press rating of 8/10, it is now available on iOS! Steredenn: Binary Stars is the hugely expanded version of Steredenn. Enjoy infinite replayability and unforgiving gameplay through intense boss fights, (almost) randomly generated environments, twisted space events and a massive arsenal of weapons. 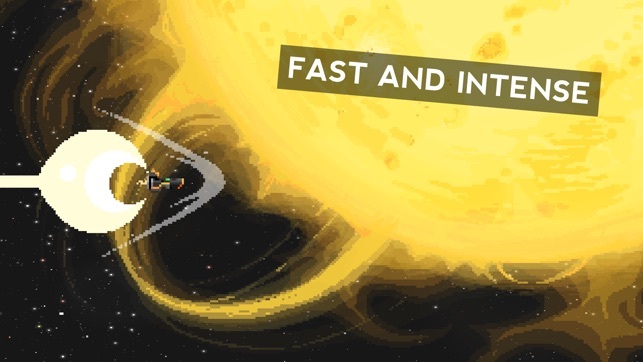 Enhance your ship during your flight with upgrades aplenty, and forge your own path across the universe! - QUICK, INTENSE SESSIONS: with rock-hard boss battles that’ll keep you coming back for “just one more run”. 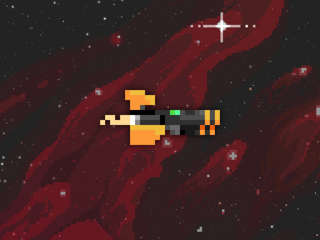 - 4 PLAYABLE SHIPS: each with its own special ability and playstyle. 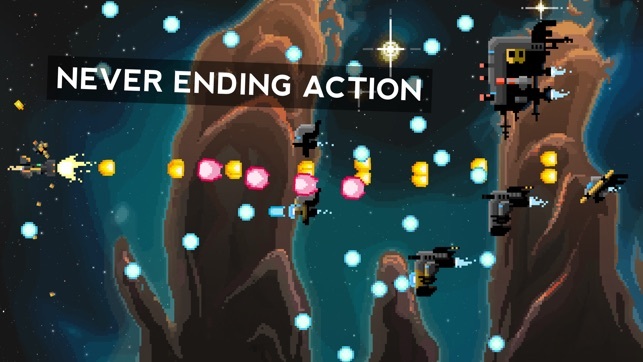 - MIGHTY ARSENAL: 42 weapons and 30 upgrades with tons of customisation options. Driller, ultralaser, giant saw, robots, hypergun? We got you covered. Next-gen abilities, mysterious alien powers, improved weapons? Yep, there's an upgrade for that. - BOSS RUSH: fight a weekly selection of epic bosses and work your way up the leaderboard. - DAILY RUN: Try to get to number one in a special daily leaderboard where all players share the same run, guns and bosses. Be ready - you only get one chance per day! - ARENA: Unlock a boss by defeating it in the main game. Then, train against it in a 1-on-1 duel. Your guns, your laws, your fight. - THE ULTIMATE EDITION: Loads of new content, reworked balancing, scoring, optimisation & always more polish. It's time. 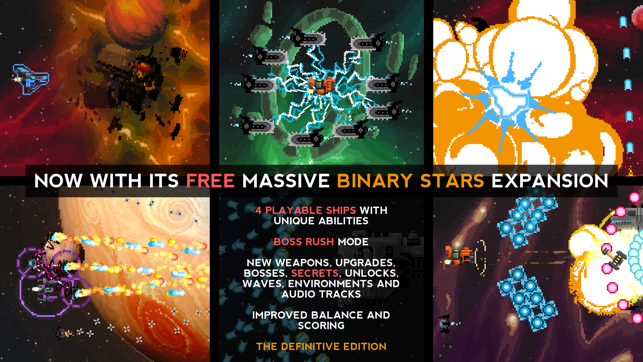 Binary Stars is here. And it's the definitive edition of Steredenn! - 4 playable ships with unique abilities (Tempest, Fortress, Fury and Specialist). Each has a unique playstyle. New ships are unlocked after you beat certain bosses. - Boss Rush mode. Fight a weekly selection of epic bosses and work your way up the leaderboard. - New content: 18 weapons, 5 upgrades, 2 bosses, 6 secret bosses, 7 artefacts, 42 waves, 4 events, 14 environments and 3 audio tracks. - Cargos can drop medkits. - Improved UI, texts, balance and scoring.